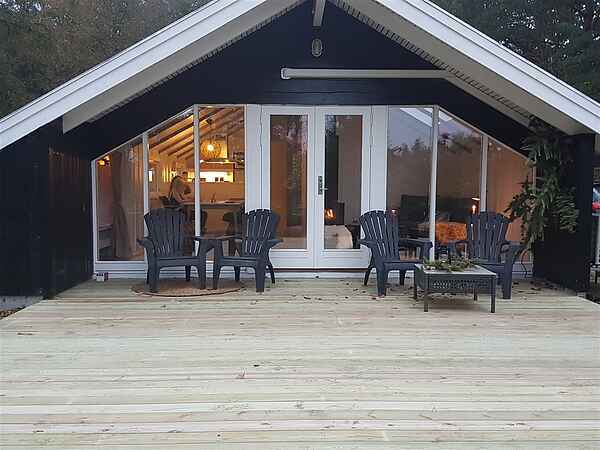 In the heart of Sejs, close to Silkeborg, and as the closest neighbor to the protected area Sindbjerg & Stoubjerg and Silkeborgs Nord Skove, this cozy and newly renovated cottage is situated. The house is located on a 2000 m2 large natural plot. The house is newly painted inside and out, new floors, new appliances, new single room with washing machine. New heat pump that provides cheap and efficient heating as well as air conditioning. The house is 60 m2 and is furnished with 2 bedrooms with 2 beds in each room. Cozy living room with a small integrated sleeping area as well as a wood burning stove. New kitchen in connection with the living room. From the living room there is access to a 30 M2 large new terrace to the south and with magnificent view to Sindbjerg & Stoubjerg. In the back yard you have the Silkeborg North Forest which is perfect for a hike and excellent for a mountain bike ride. The house is located close to the train path that can be heard during the daytime. However, the trains run at low speed. The house is smoke free and pets are not allowed. "The Small Fish" beach at Gudenåen. "Ladepladsen" Public place directly at Gudenåen. Svejbæk station - Train connection to Aarhus or Herning. Shopping. REMA1000, Super Brugsen, 2 x Pizzaria, baker, butcher and more. 5 minutes from Herning / Aarhus motorway. Path systems for both hiking and cycling.